If one were to ask a manager of custodial operations what the most costly cleaning tasks are at their respective operation, the most common answer would probably be the stripping and refinishing of floors. The cost of labor keeps increasing, while available dollars to clean and maintain facilities decrease. When floors aren’t stripped and refinished often enough, the floors begin to look dull, and the facility’s image is at risk. Anything that can be done to keep a floor finish looking clean and bright — in a cost-effective manner, goes a long way for customers. Many tools are available to help cleaning managers get the most for their dollar. It’s especially true of floor care. Many machines on the market enable managers to maintain facilities at an optimal level, for a reasonable cost. 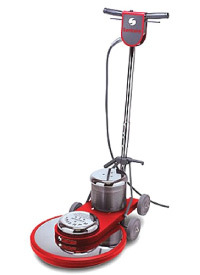 One piece of floor equipment that can greatly enhance the shine on floors is the floor burnisher. Generally, a floor burnisher is a machine that burnishes the floor finish to a high state of gloss and enables the operator to cover large areas of floor in a limited amount of time.